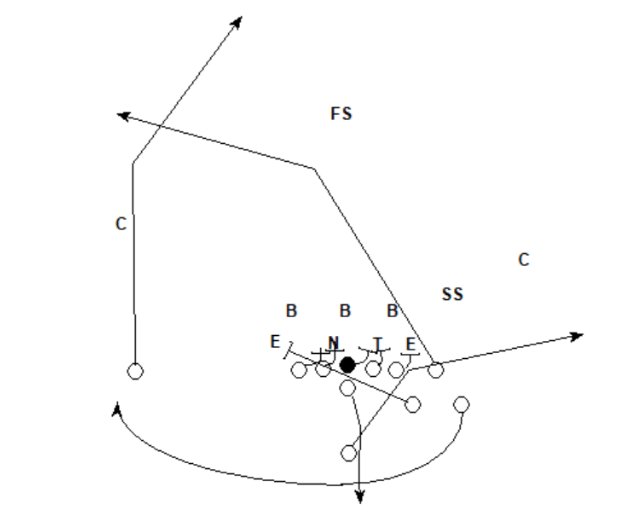 You can run this versatile concept from numerous personnel groupings and formations, but it&apos;s usually used as a play-action pass, and always includes a deep skinny post on the frontside of the play, and a deep cross route coming from the backside. The concept usually includes some type of frontside flat control with a back leaking out into the flat. The QB will come off the play-action fake and read, 1. Skinny Post, 2. Deep Cross, 3. Flat. The concept is best utilized versus single-high safety coverage. The play-action fake can usually force the inside hook defenders to step up, creating space for the deep crossing route. The back leaking out in the flat is usually able to control the flat defender, leaving one defender in position to take away the deep cross: the free safety. 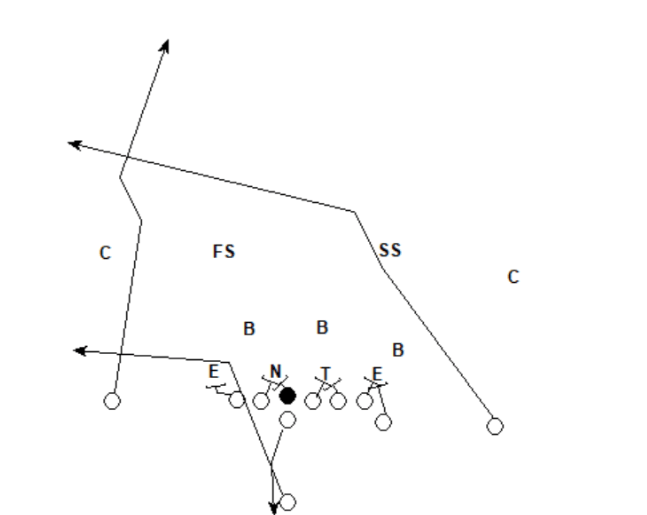 The offense puts the free safety in conflict by running a deep skinny post over the top. 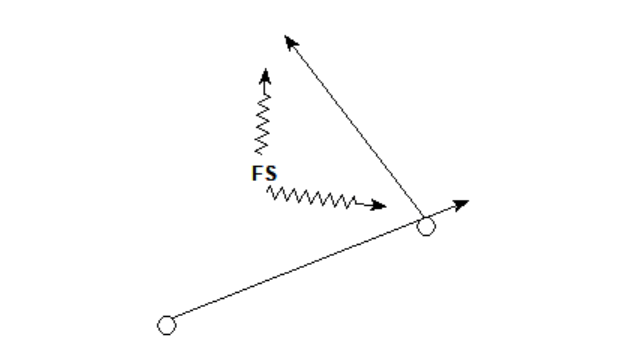 As you can see in the diagram below, the free safety can either get depth to protect the post or drive on the crossing route, but can&apos;t take away both, which usually leaves the offense with one shot down the field at an explosive play. 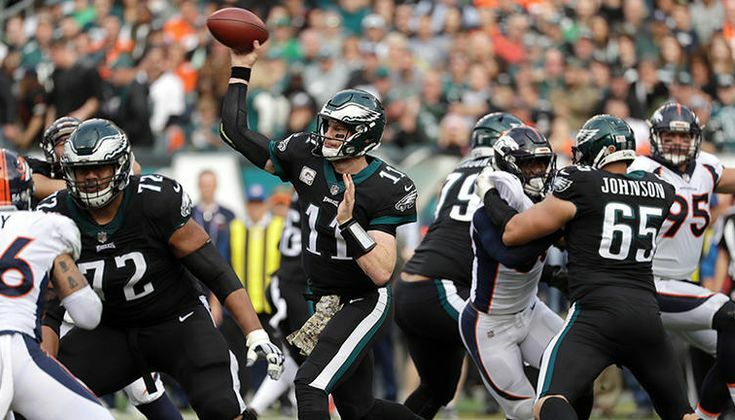 Below is a video of the Philadelphia Eagles running this play from 11 personnel in the shotgun versus a single-high look from the Houston Texans, who start in a two-high look but then spin to a single-high on the snap. Both inside linebackers step up, which leaves space for the slot receiver (No. 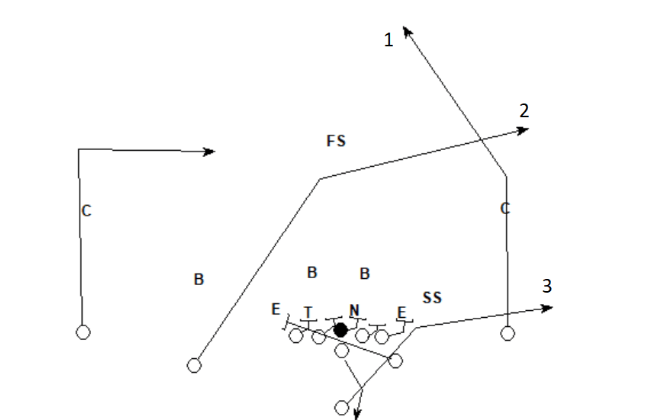 81) working across the field on his deep cross route. 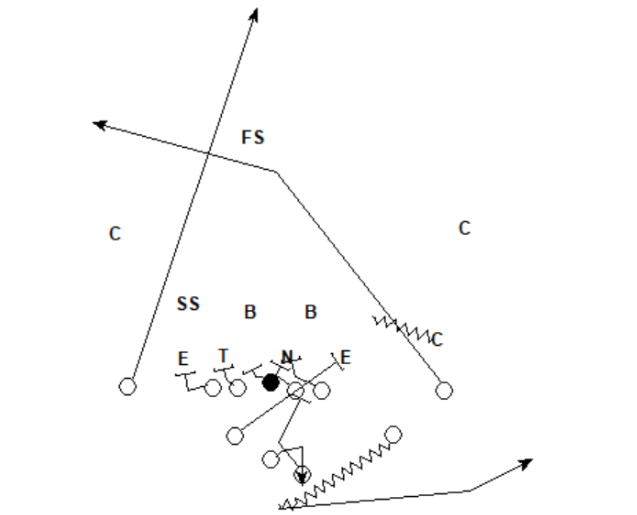 The free safety drives on the crossing route, which leaves space for the deep skinny post over the top. The quarterback doesn&apos;t necessarily read the free safety, but his progression read from the post to the cross most likely makes that defender incorrect if he makes the right read. The run-action garners a similar response here from the Giants’ defense, but this time, the free safety gets depth to protect the post, which causes the QB to get off the post and throw the deep cross for a big gain. With the frontside safety (No. 23) playing at a depth of about eight yards, and with his eyes in the backfield, he can&apos;t get enough depth to give help to the post, leaving the offense with a 1-on-1 deep shot opportunity. The offense adds a nice wrinkle by having the frontside receiver take an inside stem, before leaning the corner back outside, and then breaking back to the post as the corner starts to lean. The receiver&apos;s initial stem gives him leverage to the post, and his lean back outside helps create the separation at the top as he breaks to the post. Note how much the defense reacts to the backfield action on both clips, and how much space it creates for the offense to throw downfield. The offense doesn&apos;t have any frontside flat control to help open space for the deep cross, but doesn&apos;t necessarily need it due to the heavy run-action. As was the case with the other clips, the run-action helps create a lot of space for the deep cross, and creates a 2-on-1 for the offense on the free safety with the defense in a single-high look. The Yankee concept is a great way to create some explosive shot opportunities downfield. Due to its versatility, it&apos;s good for almost any style of offense, and can be window-dressed in many different ways to prevent tendencies.